Piranha Sue is a long, female Piranha Plant. Her only appearance was in the Feb. Issue No. 1, Piranha-Round Sue. In the story, Piranha Sue was sent by a large number of Piranha Plants (all of which were under King Koopa's rule) in order to steal the Green Gecko Gem from Mario and help the Piranha Plants break free from Bowser's rule. She used Toad in order to trick Mario into putting down the gem so she could steal it. Her plan works, but soon after declaring world conquest, King Koopa grabbed her by the neck. She then told King Koopa that she had stolen the gem for him, but he tossed the gem aside saying it has no value. It is unknown what happened to her (as she was never seen again), but it is likely she was punished by King Koopa. Piranha Sue has the power to stretch her vines very far. 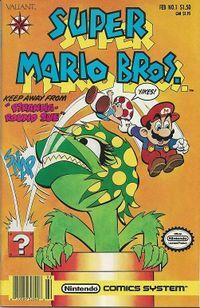 Piranha Sue is seen trying to bite Mario on the cover, but she never actually used this attack in the comic. This page was last edited on October 7, 2018, at 01:02.